RSD 2017 ViNiLiSSSiMO MR-SSS 546 vinyl; Pro-Ject RM-5SE with Audio Tecnica AT440-MLa cartridge; Speedbox power supply); Creek Audio OBH-15; AUdioquest King Cobra cables; M-Audio Audiophile 192 Soundcard ; Adobe Audition at 32-bit float 192khz; clicks and pops removed with Click Repair on very light settings, manually auditioning the output, and often turned off for large sections of this record; further clicks removed with Adobe Audition 3.0; dithered and resampled using iZotope RX Advanced. Converted to FLAC in either Trader’s Little Helper or dBPoweramp. Tags done with Foobar 2000 and Tag and Rename. This is a very solid record from Marcos Valle in what would these days be called his ‘boogie’ phase. I suppose it can’t also be called ‘yacht rock’ because, a) there’s not much rock here, and b) on the album jacket, Marcos definitely looks more like the guy selling suntan lotion (and maybe a little something extra for your voyage if you seem hip) down at the pier, moreso than he resembles the owner of a yacht. 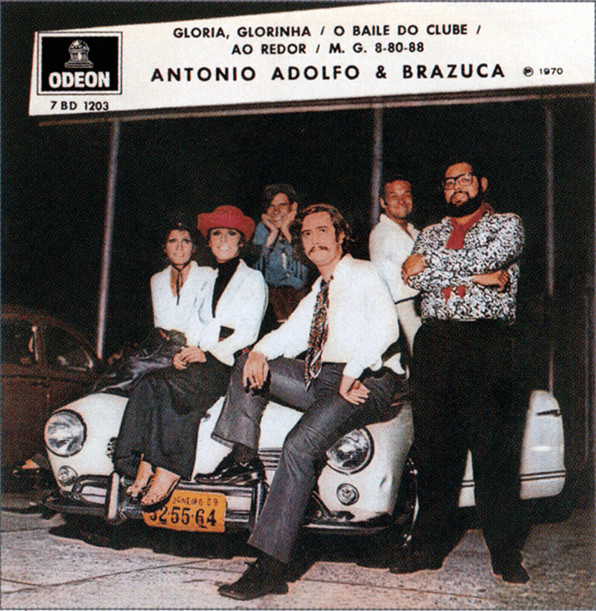 This album also answers the unasked question, “What would it sound like if you put Chicago’s Peter Cetera and Brazilian accordion wizard Sivuca on the same song?” The result was the moderately big hit single “A Paraíba não é Chicago” that opens up this upbeat, breezy album. Cetera contributes bass guitar to unspecified tracks, as do the great Jamil Joanes (who played with Banda Black Rio, Gal Costa, Tim Maia, and many others) and Luizão Maia (Antônio Adolfo e A Brazuca, Fórmula 7, Elis Regina, João Bosco and many more). Sergio Dias of Os Mutantes plays a guitar or two somewhere here. The eclectic mix of magic helper elves continues with sessions credits from three other members of Chicago (Danny Seraphine, splitting drums duties with the ubiquitous Robertinho Silva, and horn players James Pankow and Walter Parazaider), and co-writing credit from both Cetera and soul singer Leon Ware on four songs. Valle worked with both those guys during his second stretch living in the USA, and his melodic flare is in heavy abundance on this Ware track Rockin’ You Eternally, also from 1981. Robson Jorge and Robertinho do Recife (on guitars) and Airto (on percussion, although you wouldn’t really know it’s him) are in the mix as well. Marcos Valle sounds natural and in his element here, still youthful and not at all like he was simply keeping up with the times while approaching the milestone of twenty years as a recording artist. Although I will probably always prefer his string of home-run classic albums from the late 60s and early 70s, I’m glad his work from this period is getting more attention lately, as evidenced by this special 2017 Record Store Day repressing by Spanish label ViNiLiSSSiMO. * Marcos Valle has never needed to be ‘recuperated’ as hip, because he’s like some kind of Brazilian Brian Wilson, without the mental instability and a much longer span of productivity, a guy whose work has stayed afloat above the tides of fashion as effortlessly as the most expert surfer. There are no bad songs here, although the shimmery slick production may occasionally get in their way, depending on the listener. The instrumental Campina Grande continues the album’s peculiar fascination with the state of Paraíba (they have great beaches there…), using a Northeastern rhythmic foundation for a piano melody that is evocative of Valle’s bossa nova years. If he had recorded an English-version of the radio-friendly, mid-tempo “Sei lá”, he might have been a household name in the northern latitudes. But I doubt Rio’s golden boy loses much sleep over that notion. *Unfortunately, in terms of mastering and sound quality, I’m fairly confident they just took a CD and slapped it on wax, which ignores that the two media have different properties. The good news is I am guessing they used the Japanese reissue on Bomba Records, since it doesn’t pin the meters to 0 db in a solid slab of ‘brickwall’ like I suspect the Som Livre 2006 CD, based on all their other CD reissues. Anyway, I guess it’s nice to have around for analog playback, at a reasonable price. Transfer info: Copacabana vinyl; Pro-Ject RM-5SE with Audio Tecnica AT440-MLa cartridge; Speedbox power supply); Creek Audio OBH-15; Audioquest King Cobra cables; M-Audio Audiophile 192 Soundcard ; Adobe Audition at 32-bit float 192khz; clicks and pops removed with Click Repair on light settings, manually auditioning the output; further clicks removed with Adobe Audition 3.0; dithered and resampled using iZotope RX Advanced. Converted to FLAC in either Trader’s Little Helper or dBPoweramp. Tags done with Foobar 2000 and Tag and Rename. Well I had this post nearly ready to share for Saturday but other things got in the way. Although the festas juninas were officially over, there were still pockets of activity and parties going on in the Northeast through the weekend. Oh well, pé de serra has no expiration date, it’s good all year round. 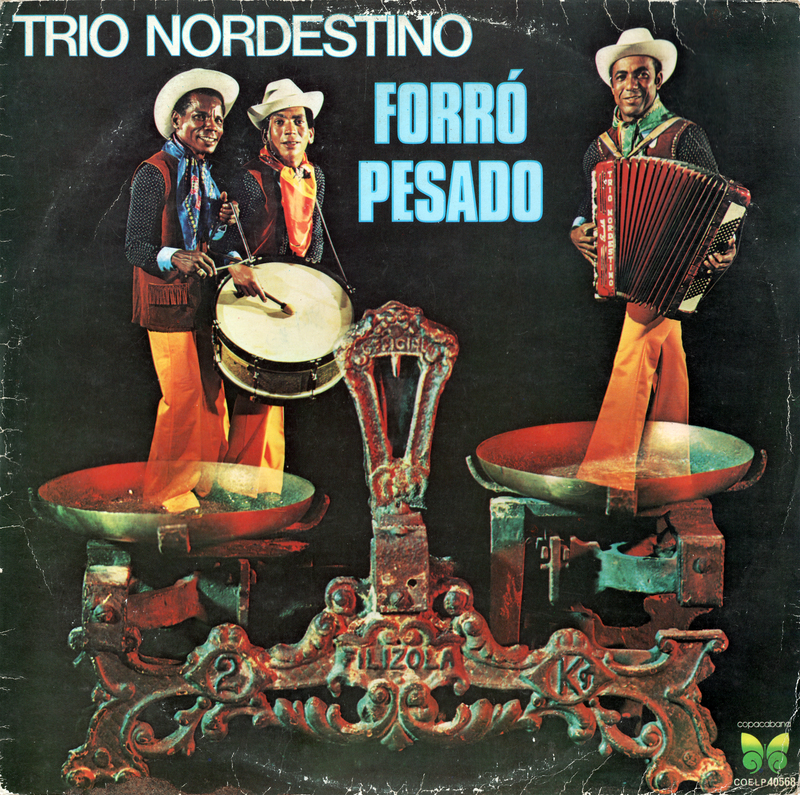 The album title “Trio Nordestino and The Man In The Dress” might initially have caused me some trepidation. Northeast Brazil, for all its charms, is also a deeply troubled place and has been since the days of colonization and slavery. It bears the dubious distinction of leading the country in homicides and in violence against women. Add to those statistics a horrifying rate of violence against transgender individuals, and one could almost forgive the ham-fisted public health “discourse analysis” article I unfortunately stumbled across recently, which sought to link the lyrical representations of masculinity (and related themes of violence, homophobia, etc) to this hard data. There are, of course, all kinds of valid arguments one could make by looking at cultural production this way, but these authors chose to cherry pick the worst examples they could find (using a broad quantitative sampling technique whose criteria are known only to them), as well as some very obscure songs that had no broad social impact and were probably not heard beyond a few hundred people, and decontextualized them rather thoroughly to hammer home a very unsophisticated, knee-jerk argument that did a disservice to the very real problem of gender-based violence. So, you can imagine my relief when the lyrics of “Homem de saia” turn out to be not just relatively harmless, but practically progressive, to use the current parlance. It’s simply about a man trying to crash an all-female social event, a party where everyone from the person working the door to the members of the band were all women, by disguising himself in a dress. He is found out, and bounced from the party. Hilarity ensues? 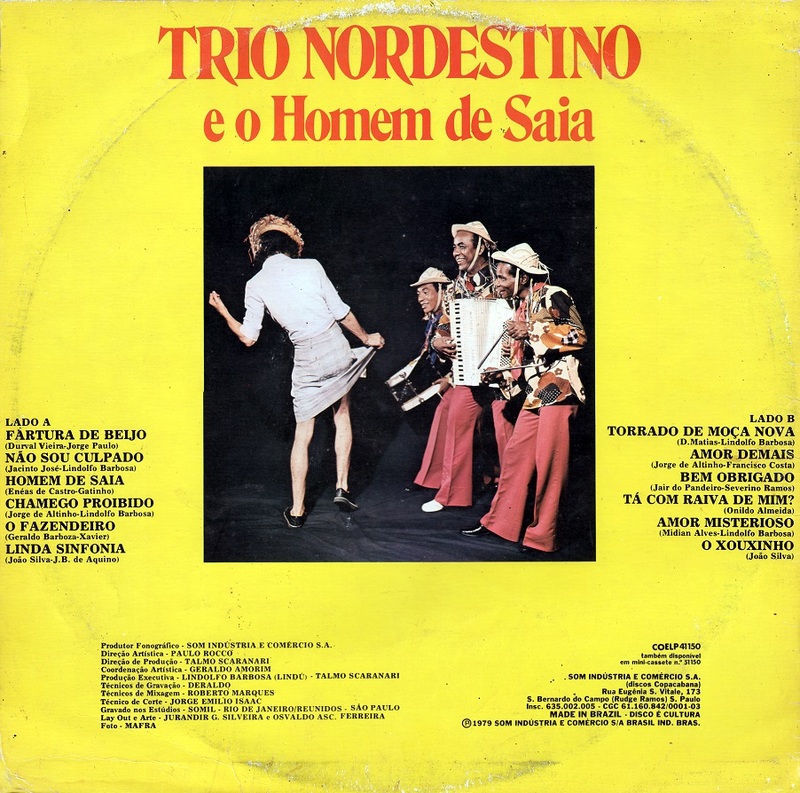 Anyway, one could argue that Trio Nordestino e o Homem de Saia is about the role of exclusively female spaces and their necessity in a culture tainted by patriarchy, which encompasses contentious debates between women with a uterus and transwomen. Who knew Trio Nordestino would be so prescient? And for my next trick, I’m going to make this glass of whisky disappear. Musically speaking, this album once again shows the group in fine form and with lots of memorable tunes, even if it lacks contributions from Dominguinhos and Anastacia like the last one I posted. Não sou culpado is a catchy invocation blending proud regionalism with an assertion of the Nordestino’s brasilidade or national belonging. Linda sinfonia brings us a frevo in a forró style. Bem obrigado sounds like it was written for Jackson do Pandeiro and I wouldn’t be surprised to see him covering it in the 1980’s, it has his syncopation and cadence imitated perfectly. But what may be most striking is that the Trio has “modernized” with electric bass and a full drum kit here. Even I tend to hear the new, electric forró bands – most of which are not my cup of tea – as having little to do with traditional pé de serra. But as always, these things are more of a continuum than a sharp break. If you listen to the slightly-funky bass riffs on this album and the way the drummer plays loud, booming fills on the tom-tom drums at the end of the choruses of the album’s title track, the stuff ain’t that different than Mastruz Com Leite, arrangement-wise. I realize that I’ve fallen into the trap of only posting about this type of music around São João season, which is a pity. I promise to do better in the future and keep them coming throughout the year. Vinyl transfer info: Original Philips vinyl; Pro-Ject RM-5SE with Audio Tecnica AT440-MLa cartridge; Speedbox power supply); Creek Audio OBH-15; AUdioquest King Cobra cables; M-Audio Audiophile 192 Soundcard ; Adobe Audition at 32-bit float 96khz; clicks and pops removed with Click Repair on light settings, manually auditioning the output; further clicks removed with Adobe Audition 3.0; dithered and resampled using iZotope RX Advanced. Converted to FLAC in either Trader’s Little Helper or dBPoweramp. Tags done with Foobar 2000 and Tag and Rename. Today (June 24) is the feast day of St. John the Baptist, otherwise known as São João holiday in Brazil, which of course is a really huge deal in Brazil. Earlier this week we had an offering from Trio Nordestino. Now let’s have something for the universitário set with this mid-70’s record from Quinteto Violado. This record seemed a bit more fun to prepare for the blog than the other record of theirs that I posted a whole FOUR YEARS ago, over here. There you can read all about my misgivings about this kind of conservatory-trained appropriation of roots music. I’m not sure if I’ve loosened up, or if they have on this record – the group sounds a little less “studied” and more flowing here. Even if Berra-boi might be the “better” record, it sounds like they are having fun here. The blazing instrumental acrobatics of Rumo Norte and its wonderful, almost Beatle-esque vocal harmonies make me hopeful they won’t be hamstrung by any traditionalist puritanism. Or maybe the sense of fun is really just the “well-oiled machine” effect of groups that have been playing together for a while as a unit. It’s hard not to be impressed by their virtuosity here, but it still lacks something in the way of passionate conviction. Their deconstruction of the Luiz Gonzaga / Zé Dantas classic, A Volta da Asa Brança, is certainly fun to hear. It’s artful (or maybe just ‘artsy’), clever and playful and non-confrontational (unlike Caetano Veloso’s rendition that pushes into edgy performance art territory, as seen in the Phono 73 film). It’s cool, and their drummer is on fire in the bridge, but it’s coolness is also kind of emotionally flat, isn’t it? Quinteto Violado often sounds like they just need a vocalist with some soul to make their case more convincing. But then again, awkward or uninspiring vocalists seem to be a thing in music linked to Pernambuco, so maybe its just something I’m still not ‘getting’ after all this time. Like much about ‘roots music’ itself, sometimes you just have to be from there, so just ignore everything I’m saying. Just listen to the drummer, he’s incredible. What the hell is he doing on Mundão, besides blowing my mind? They hit all the Northeastern folkloric touchstones here, with motifs from at least a dozen different genres of music or ‘dramatic dances’ that you will find only in the Nordeste, with particular emphasis on their native Pernambuco. Obviously there is the presence of forró and even a guest appearance by the late, great Dominguinhos, who co-authored “Sete Meninas,” which opens up the second side. He even sings a little on it. You’ll also hear a simulated glimpse of a sacred jurema ceremony and a devotional homage to the caboclo spirits that animate them on Canindé. Ciranda, chegança, boi bumba, caboclinhos, cavalo marinho, and pifanos, pifanos, pifanos! If those words alone excite you then you will at least enjoy spinning this a few times. If you don’t know them, well don’t expect me to be all didactic about it, after all I’m not writing a book here. If I were writing a book, my life would probably be in a lot better shape than it is right now. At the very least I wouldn’t be spending the night of São João, Midsummer’s Eve in my hemisphere, alone in front of a computer screen. and think about the bubbles.